Today’s Maximumble has a peculiar predicament. If you want to see the sky, move to Montana. If you want to grow gill slits, live in Seattle. My location is usually free of sky-blocking clouds during interesting phenomenon. @Maskman: And if you want to grow a hard, scaly, heat-resistant skin, live in the South during the summer. I can’t help but wonder why Biff would want to blow up the moon. @Jackson; Presumably, because it blocks his view of Venus. @MaskedMan how dare you call Marvin the Martian obscure!!!!!!! cartoon network recently showed that exact episode of bugs bunny! There was supposed to be an earth-shattering kaboom. Where was the earth-shattering kaboom? Awwww Saettle weather fail makes it into Biff…. sad day, but funny as all get out. I’m in Lynnwood, which is a commute away from Seattle. We do have clouds today. 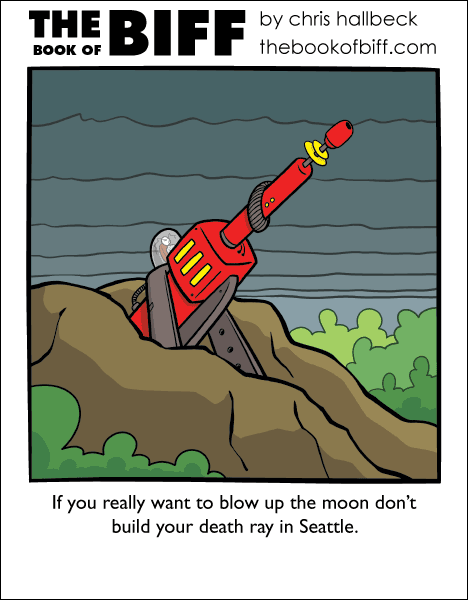 Blowing up the moon seems like the ultimate in attention-grabbing spiteful deeds. I live North of Seattle. This my life.